I am linking up again with Holly at Fourth Grade Flipper for Tried It Tuesday! I love using Bloglovin' to read all of my favorite blogs. I even have them categorized to make it easier to find the blogs I read the most for different reasons. But the one thing that drove me crazy was not being able to pin effectively from the blogs or that I would have a hard time with contests. I would try to pin from them and get an error message that I couldn't do it. Or I would try to go to links in a contest and struggle to enter. Sometimes even just external links don't work right. It doesn't happen on every blog, but it did on some. Well, it was an easy problem to solve. Here is what I did! Notice on the Bloglovin' frame around the post that there is a quirky little "x" at the top. Just click on the "x" to make it go away. Now you are out of the "frame" and ready to pin or enter contests. Now it doesn't happen all the time, but when it does, you know what to do! Happy pinning and winning! So, what have you tried this week? 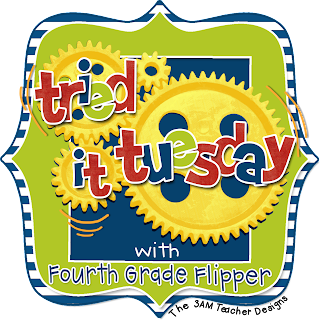 Link up with Holly at Fourth Grade Flipper for Tried It Tuesday and let us all know! And don't forget to enter Jennie's and my giveaway! Today is the last day!!! Thanks for the tip! I've had trouble with that too. I have had trouble with commenting! I will try this the next time and see if that is the issue. Thanks! Me too Ms. OCD, Why can't I comment when using bloglovin ?? It drives me crazy and then I forget what I wanted to say and on what blog when I finally get on my laptop. Thank you for letting us know about this. I don't like when I am on Bloglovin' and want to copy a link of a post and it automatically has the Bloglovin address connected with it. Then I have to go and Google the real blog address. Drives me bonkers! This was driving me crazy too. Thanks for sharing your tip. Thanks for the tip - it's been driving me crazy! What a great tip! I really can't stand reading blogs in the lovin' app because there is so much I can't do. This makes sense and I would have never figured that out. Thank you for sharing! Thank you so much for sharing this! I could never go to TPT without having to sign in every time. I hated that!